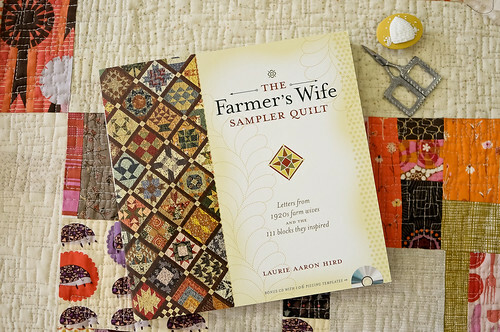 I can’t stop thinking about the Farmer’s Wife Sampler Quilt. Several months ago, Angela & Amanda started a quilt-a-long for it and it seems like everybody has joined it. I have been trying to resist since I have so many projects on the go already and was feeling intimidated by it. But everyday, I have been seeing blocks like this and this and this and especially this. Now I’m so jealous and I’ve decided that I’m going to start this project in January. New year, new project! In the meantime, I’m going to finish up some lingering quilting projects. It’s a win-win situation. There are 111 blocks in this quilt. It’s a big commitment, but you certainly don’t need to do all of the blocks. There are versions of the quilt with as little as 50 blocks. The online quilt along is aiming for 2 blocks every week, but I’m just using this is a guideline. Life is busy and some weeks I might not make any blocks and other weeks, I might make four. Can we do this together? Wanna join the Farmer’s Wife movement with me? I think I might do it… with all my own fabric… I also like that two new collections are going to be added as I go along. just saying. yes please! i want in on this! Gaaahhhh! Of course I want to do this! It would be so fun! I’m Jacqueline’s friend from Los Angeles and I am in! I’m doing a 1930s theme. Thanks! I’m new, but I’m in! I’ve been bitten, hard, by the quilting bug! (Symptoms of said bug-bite include dizziness at all the glorious fabric out there, and an inability to do the math on how many free hours there are in one’s life vs. how many hours all those planned projects are going to take!) Did I mention I’m in? Been on my list of things to do for ages, even have fabric and book, just haven’t started due to overwhelming other projects. New Year might be a good incentive for me too. What a nice idea! I’m just a starter in quilting and from the other side of the world;-) (The Netherlands) But I would love to join you in the beginning of New Year! I’ve also been watching the quilt-a-long through the fall and been thinking of joining in in January. I think this will be a great project for that post-holiday time when everything feels a bit bare after all the excitement. So funny that you posted this because I had already made the decision to start after the new year! This is a nice idea! I’m never good about following through on commitments like this, but you might just have convinced me to try…. i’d like to give a go. perhaps a little structure will help me actually finish something? But – I cannot wait to see what fabric choices you make, because I know it will be beautiful! Yes, yes, yes! Count me in for sure! I’d love to try it! Are you going to sell the book at the workroom? Hi Marie – Yes! We already have copies of the book in the shop with more on the way. I am already a member of this group and have about 40 blocks made…still a long way to go for the king or queen size I have planned. Love the idea of getting together in person to discuss or just hang out, maybe even fabric swap…? Glad you’re jumping on the band wagon (or tractor). January – I’ll do my best to share my experiences and any tips i learn along the way for sure! yay! i’m so excited to work on this with you guys! I would love to make this quilt with all of you! What fun we could have! I live in the US and rarely find any groups like this. Oh what a great idea for January!!! Count me in! YAY! Only if I can do mine by hand! carolanne, i’m seriously contemplating doing mine by hand actually! i think it might be more manageable for me…. I am also (already) in the flickr group, about 39 blocks made so far — but it would be great to connect with fellow FWQALers in person 🙂 The blocks are quite addictive — with many very straightforward ones, offering some relief from the more finicky ones. Fun. i would love to do this, but i just don’t have the time. i think it’s wonderful that you are starting another group, so that people (like me) who have been drooling over the lovely blocks can join in! Yes, I am in! Like Melinda, I’ve got the quilting bug in a bad way! Are you going to start a new group or should we join the existing one? I don’t know why I didn’t comment on this before but I am joining in! I got the book for Christmas and recently organized my scraps so I am ready.